Several supplements have hit the market recently touting the inclusion of a new nitrate ingredient with unique qualities: potassium nitrate. Most notably of these are iForce Nutrition's Tropinol XP and their standalone Potassium Nitrate supplement. We like new ingredients at PricePlow, so we try to take a look at anything new hitting the market and help you figure out if it does what companies claim it does, and ultimately if it's worth spending money on. Note: In this write-up, we mainly discuss potassium nitrate as a dietary supplement. Potassium nitrate is as its name suggests, an ionic salt of potassium and nitrate. It has an approximate 2:3 ratio of potassium to nitrate. The origins of the compound can be traced back as early as the 1200s. It has since been used as a food preservative, thickening agent, fertilizer and oxidizing agent in gunpowder, fireworks and explosives. Its "chemical name" is KNO3, and is also known as saltpeter. The compound also has a long history of use in the medical field. Potassium nitrate is commonly used for the treatment of high blood pressure, asthma and kidney problems. Nitrate supplements have been taking the industry by storm in the past few years with an increasingly strong body of research behind them. There are a number of studies in humans showing positive effects on athletic performance. Nitrates are typically supplemented in compound form with another ingredient, and several companies have been putting out nitrate combinations that have synergistic effects (such as arginine nitrate in USPLabs Yok3d, and Cellucor NO3 Chrome). This has typically been limited to amino acid bound nitrates, but some companies are trying to get creative and look for new combinations. Potassium nitrate is an excellent choice because a couple of the effects of potassium synergize well with those of nitrates. Everybody loves getting that big muscle pump when they're working out, and both potassium ( 1 , 2) and nitrates (3, 4) have significant vasodilatory effects that increase blood flow and give you significantly better muscle pumps. Modern diets are typically very high in salt and low in potassium. A poor ratio of these minerals in the diet can lead to high blood pressure and endothelial (blood vessel) damage. Potassium helps counteract the effects of sodium by reducing blood pressure (1) and protecting endothelial cells from dysfunction (2). Nitrates also reduce blood pressure (5) and protect against endothelial dysfunction (6) by increasing nitric oxide levels. A big plus for potassium nitrate in this area is the fact that blood pressure effects are self-mediated. That is, at supplemental doses the compound will not lower your blood pressure into dangerously hypotensive levels. Typically the effects are greatest in counteracting increased blood pressure either as a result of general unhealthiness or while exercising. A number of recent studies show that nitrate consumption reduces the energy and oxygen cost of exercise. One of the first of these studies on nitrates showed an oxygen cost reduction of 5%, and a 7% increase in gross efficiency in cyclists (gross efficiency is a common measure of cycling efficiency, determined by the ratio of cycling work performed to energy expended in the body)(7). This was accomplished without any associated increases in heart rate, lactic acid build-up or breath rate/oxygen exchange. Another study(8), this time in runners, showed acute increases in energy efficiency in low (walking), medium and high intensity (sprinting) exercise, with greater improvements at low intensity rather than high intensity exercise. Additionally, after six days of supplementation, time to fatigue was increased by an incredible 15%. 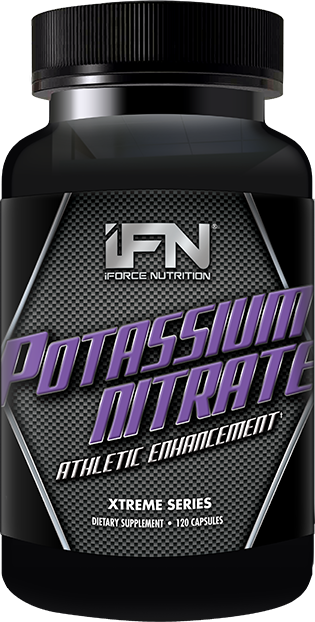 iForce Nutrition recommends you take anywhere from 2 (300mg) to 4 (600mg) pills of potassium nitrate preworkout for best effects. One study investigating nitrate effects on exercise measured time to peak plasma concentrations of nitrate and found peak to be between two to three hours after consumption(10). So consider taking potassium nitrate about that amount of time before your workout for maximum benefit. This is the biggest annoyance in taking nitrate-based supplements - the amount of time they take to kick in. When put into a standard pre workout supplement (that you normally take 30-45 before working out), you won't get the full benefits of the nitrate until the end of your workout. This is good if you're looking for a multi-phased approach... but if you want the nitrates to hit you hard, and hit you during your entire workout, you're going to need to take this separately before your pre workout. You'll need to figure out your best timing, and consider the meal timing too - it may also be slowed if you have food in your stomach. One problem with chronic nitrate usage is increased nitrate tolerance, a mechanism that is not yet fully understood but may be related to increased expression of phosphodiesterase 1 (PDE1) in response to nitrate consumption. Nitrates stimulate release of cGMP to exert their effects( 11) and PDE1 breaks down cGMP(12). Therefore it could be helpful to supplement with a PDE1 inhibitor such as vinpocetine (13) to counteract the effects of nitrate tolerance. Admittedly, this potential link lacks human data but has been studied in vitro ( 14) and shown to reduce nitrate tolerance. Nitrates carry the risk of causing methemoglobinemia and increased oxidative stress. However, these effects are at incredibly high doses. The fatal dose of nitrates is around 30 to 35 grams, so the dosages listed on these products will keep you safe and far, far away from those levels. At supplemental levels, in the several hundreds of milligrams, very few side effects are noted with nitrate consumption. Any serious side effects would be preceded by headaches. That said, if you do start to experience headaches with nitrate consumption, you should probably taper your dose down until you build a greater tolerance. Note that no statements on this page have been approved by the FDA. Before beginning any diet or supplementation program, consult your doctor and get his or her written consent - especially if taking prescription medication. As we write this right now, Tropinol XP is one of the few supplements with it. However, we're looking forward to the release of iForce's standalone product. We don't recommend ingesting any "chemicals" - get it from a pharmaceutical-grade source such as iForce. You can sign up for our newsletter on the right side of this page to receive a notification of its release! Proc Natl Acad Sci U S A. 2009 February 24; 106(8): 2829–2834. Aging Cell. 2011 Jun;10(3):429-37. doi: 10.1111/j.1474-9726.2011.00679.x. Epub 2011 Mar 31. J Biol Chem. 1995 Dec 29;270(52):30989-1000. Biochem Pharmacol. 1984 Feb 1;33(3):453-7. Sign up for future Potassium Nitrate news! Click the button below to sign up for future Potassium Nitrate news, deals, coupons, and reviews!